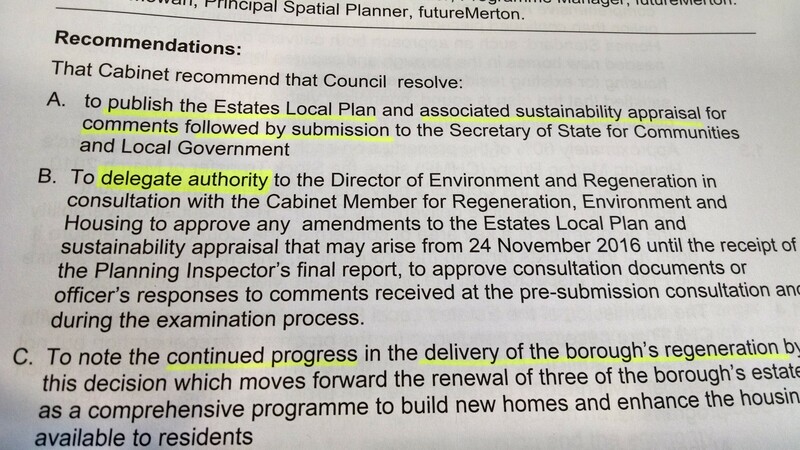 Last night, Merton’s Labour cabinet met as per normal, however the timeline for submitting the draft estates local plan to the Secretary of State was on the agenda. This is the document that residents responded to previously. 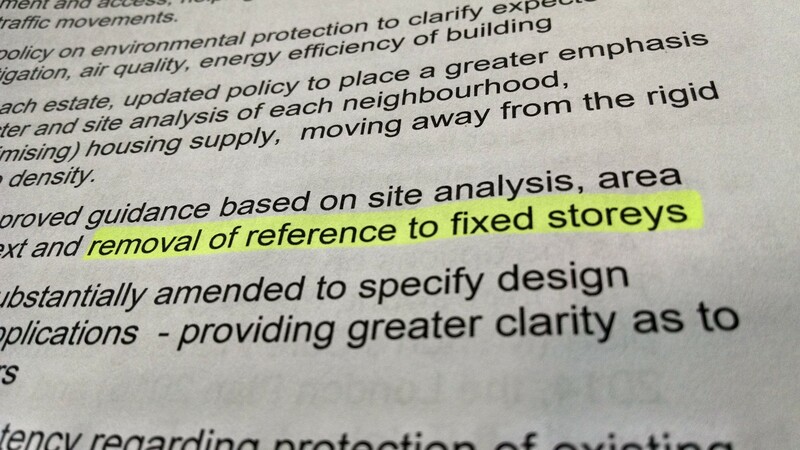 We noted that there’s a few choice words involved in the recommendations, such as decisions to delegate authority to the cabinet member for regen. This effectively avoids them needing to convene another cabinet meeting and openly discuss the agenda. 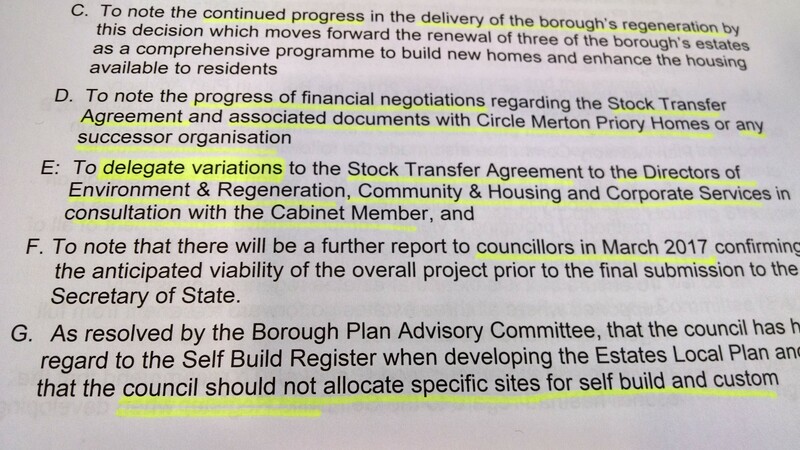 More opaque behaviour from Merton Council headed by our ward councillor Stephen Alambritis. 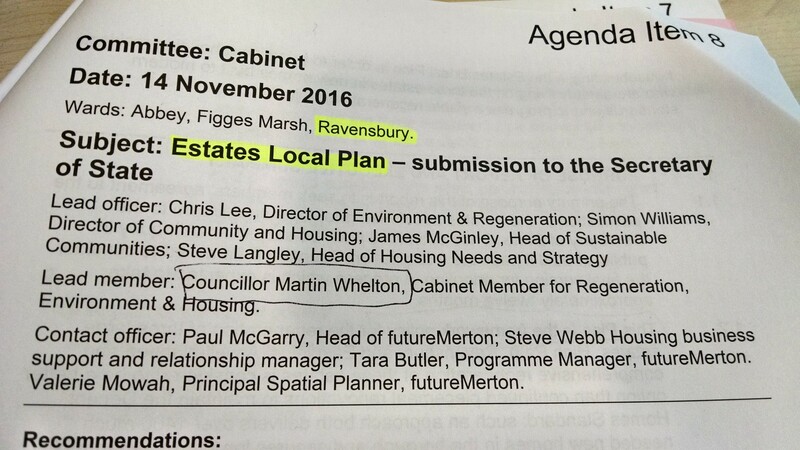 The Draft Estates Plan is now at version 3 or stage 3, just prior to the submission to the Secretary of State. The reference to actual building heights has been removed. This might be because the council could be seen as promoting heights when there wasn’t support for it, or because it was too much trouble actually stating heights relative to the negative reaction from the general public. In addition, Circle obviously wants to maximise the total floor space in the new development and will follow the planning guidelines to maximise their position when designing the new development. Those running the council might also be oblivious to the need to restrain building heights and density in Ravensbury: the recent planning permission granted for Ravensbury Garages seems to fit that assumption. Possibly they just don’t care that much because it’s not their home, community or environment. Who knows. The council made no mention of the poor method of consultation by CHMP or the stress created by this for the existing residents. Despite his promises, our Ravensbury ward councillor Stephen Alambritis hasn’t really held much of a candle to this regen process, and it still appears to be going ahead in its initial form despite Ravensbury residents being against it. This is all despite him saying it wouldn’t go ahead if residents opposed it. Go figure. In fact Stephen has come across as being firmly in the CHMP camp, pictured shaking hands with their CEO, always avoiding criticising the company and seemingly anti resident when it comes to listening and working on our behalf. Guess that’s what happens when someone thinks they are Lord over all that they survey. The value of property in Merton is around the £800 per square foot, or more. The build cost these days is around £100 per square foot. So that leaves: £800-£100 = £700 per square foot to cover profit, contingency, demolition and professional fees. On the average new build house, of 93m2, that’s roughly £650k in their pocket in the broadest terms, back of a fag packet type calculations. There’s no VAT to be paid due to the new build versus refurb. Not a bad earner if you’ve been practically given the housing stock in the first place?